An XCom: Enemy Unknown demo has made itself known. 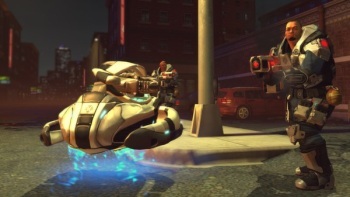 Did you know there was going to be a demo for XCom: Enemy Unknown? I did not. So it was a pleasant surprise when my Twitter feed lit up just now with all sorts of excited people yelling, "XCom demo! XCom demo!" The fact is that I'm already committed to the game - Take-Two could release XCom: The Spreadsheet and I'd throw money at it - but if somebody wants to let me start shooting at those extraterrestrial jerks a couple weeks early, I'm certainly not going to say no. The XCom: Enemy Unknown demo is available now on Steam, which also indicates that the pre-purchase rewards offer is moving along smoothly. The first two tiers, the "Elite Soldier Pack" that includes a "classic XCom soldier" and various customization options, and three unique Team Fortress 2 items have already been unlocked, while the third and final reward, a free copy of Civilization V, is about halfway to being achieved. Unfortunately for those of you who prefer to interface with your entertainment through the mashing of the buttons, the XCom: Enemy Unknown demo is PC-only. The full version of the game will be released for consoles as well as the PC, however, and will arrive on October 9.